Dental Veneers are a perfect way to ensure your smile is the best it can be – by changing the colour, shape and poistion of your teeth. We can make your smile look simply stunning. What are Veneers and how long do they last? 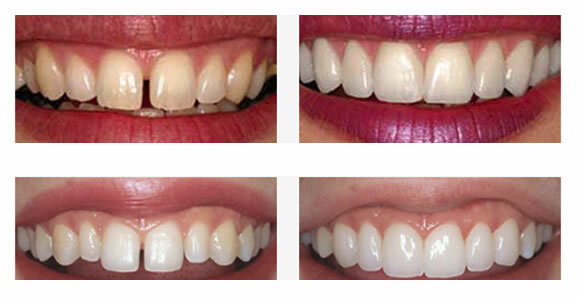 Veneers are very thin porcelain ‘covers’ that go over your natural teeth to change the shape, size, position and colour. The best looking veneers are those that look almost identical in appearance to your natural teeth, and we achieve this by using the highest quality porcelain available – to help you achieve the look you desire. With proper care and attention, veneers can last a very long time, and due to their unique composition, do not discolour like your tooth enamel. For more common questions please click a tab below. Veneers are a way to get that perfect smile, without having to go through the process of having braces fitted due to the simple fact that braces can take up to 2 years to achieve the results you need, whereas veneers can attain the same look in a very short space of time. If you have discoloured teeth, that have stained over a long period of time, with chips or cracks in them, veneers can create spectacular results. Our charges for porcelain veneers are some of the most competitive in the UK. Our prices start from £648 for a porcelain veneer. Please check our full price list to see a full list. We pride ourselves in offering great results. Please see the following examples. On your first visit we will take detailed photographs and you will be able to get an idea of what your new smile will look like. The veneers will then be constructed in wax on a custom model of your teeth, this will allow us to fabricate temporary veneers and try them in your mouth so you can see how your new smile will look. At your next visit the veneers are bonded in place and any neccessary adjustments are made to ensure you are totally comfortable with your new smile. A follow up appointment is usually arranged to make sure everything is going well and that you are completely happy. 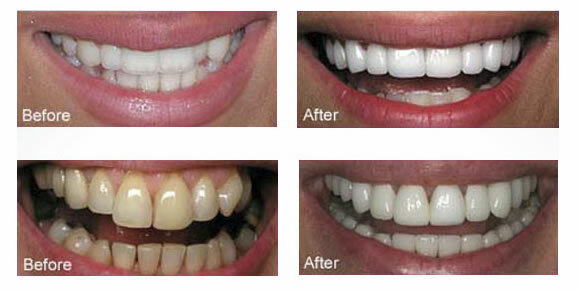 ADVICE – Veneers can transform your smile to give a more natural look. For further information on veneers and to book your appointment contact us now.